PI241. 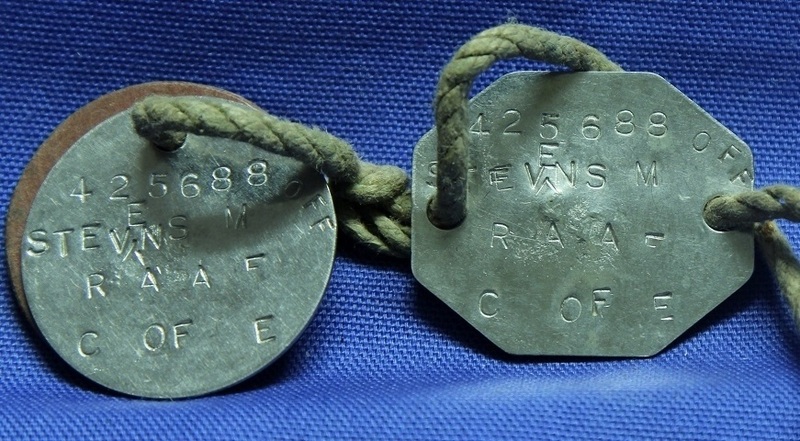 A pair of official identity discs stamped A. C. 1. LUCAS. 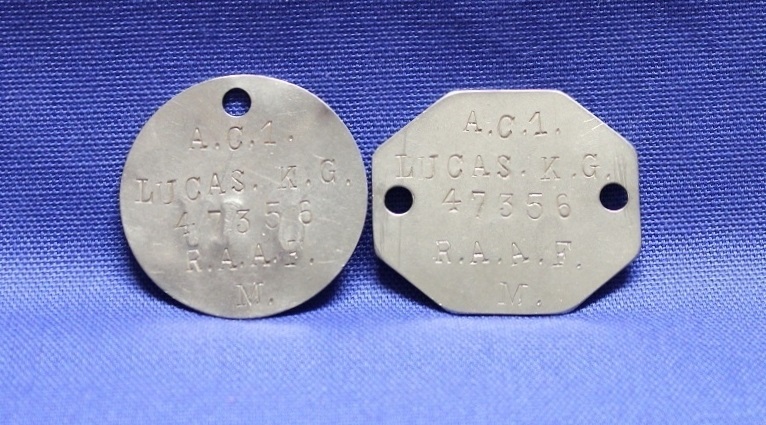 K. G. 47356 R.A.A.F. M OIV. Kenneth George Lucas enlisted on 30 Dec 1941 at Adelaide and discharged on 28 Mar 1946 as a Leading Aircraftman from Care & Maintenance Unit Tocumwal. PI243. 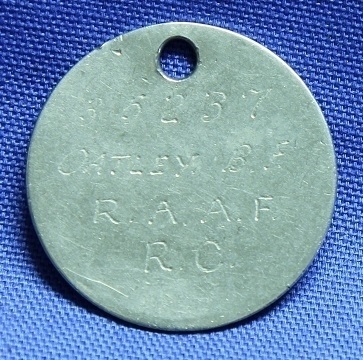 A single circular identity disc engraved 35237 OATLEY , B. F. R.A.A.F. RC A2. Francis Bernard Oatley enlisted on 27 Feb 1941 at Sydney and discharged on 28 Mar 1946 as a Corporal from 2 Flying Boat Repair Depot. PI257. 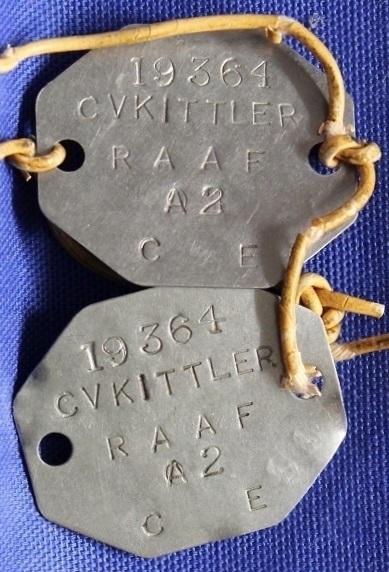 A pair of official identity discs stamped 19364 C V KITTLER RAAF A2 C E. Carl Verdon Kittler enlisted on 26 Oct 1940 at Melbourne and discharged on 13 Dec 1945 as a Corporal from 1 Flying Boat Repair Unit. PI258. 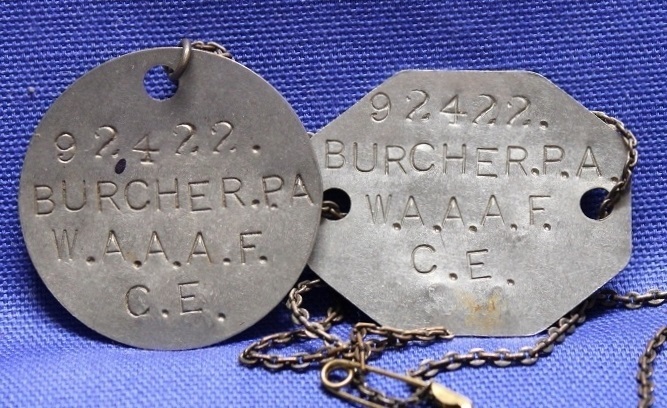 A pair of official identity discs stamped 92422 BURCHER P. A. W.A.A.A.F. C. E. A2. Phyllis Amy Burcher enlisted on 19 Jul 1941 at Sydney and discharged on 31 Oct 1942 as an Aircraftwoman from 2 Embarkation Depot Bradfield Park. PI262. 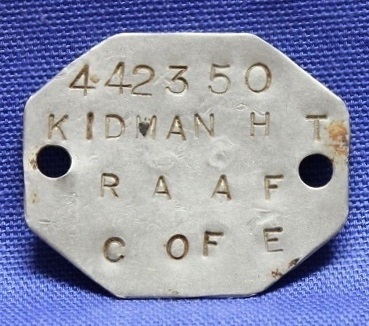 An official hexagonal identity disc stamped 442350 KIDMAN H T RAAF C OF E A2. Hurtle Tait Kidman enlisted on 19 Jun 1943 at Adelaide and discharged on 14 Feb 1946 as a Flying Officer from 5 Service Flying Training School. PI265. 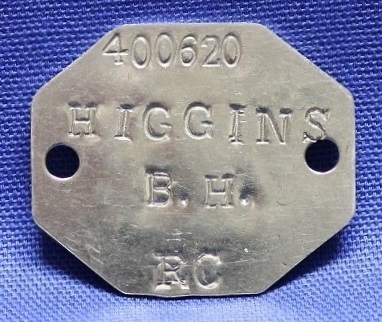 An official hexagonal identity disc stamped 400620 HIGGINS B. H. RC. Brian Hartley Higgins enlisted on 18 Sep 1940 at Wangaratta and discharged on 24 May 1943 as a Flight Lieutenant from 3 Operational Training Unit. PI274. 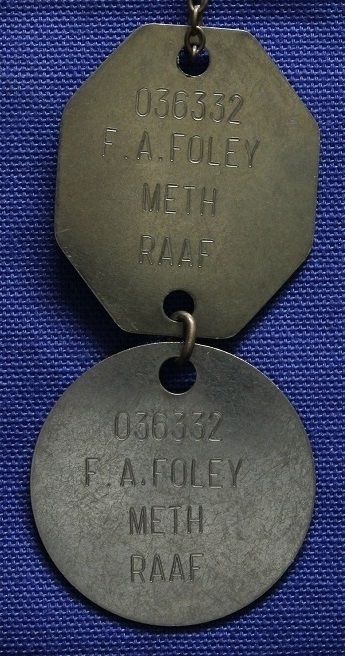 A pair of official identity discs stamped 036332 F. A. FOLEY METH RAAF A POS. Frederick Angus Alexander Foley (410883) enlisted on 27 Mar 1942 and discharged on 4 Mar 1946 as a Warrant Officer from 215 Squadron. PI279. A gold identity bracelet engraved 409057 George Andrew Kirk RAAF C of E A11. George enlisted on 21 Jun 1941 at Melbourne and discharged on 13 May 1946 as a Warrant Officer from 460 Squadron. PI283. 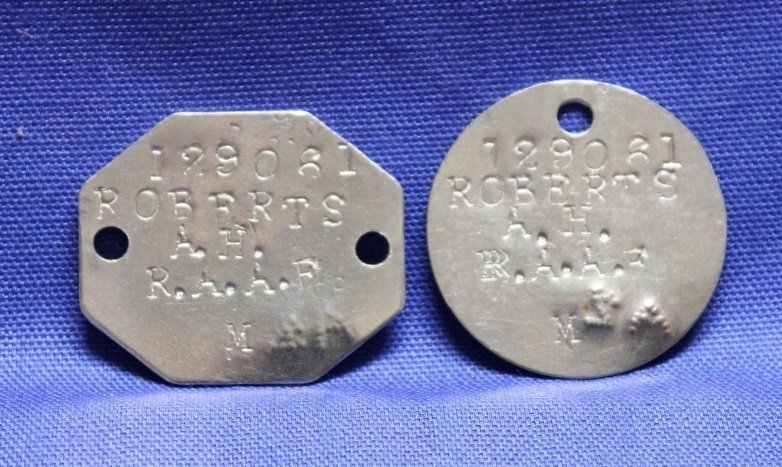 A pair of official identity discs stamped 129061 ROBERTS A. H. R.A.A.F. M A2. Alwyn Harvey Roberts enlisted on 26 Apr 1943 at Melbourne and discharged on 25 Jul 1946 as a Leading Aircraftman from Air Force Headquarters. PI286. 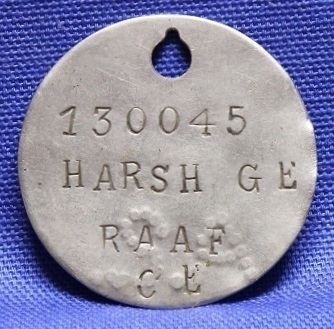 A single circular identity disc stamped 130045 HARSH G E RAAF CE A2. George Ernest Harsh enlisted on 15 Jan 1943 at Sydney and discharged on 24 Feb 1948 as a Leading Aircraftman from Eastern Area Headquarters. PI287. 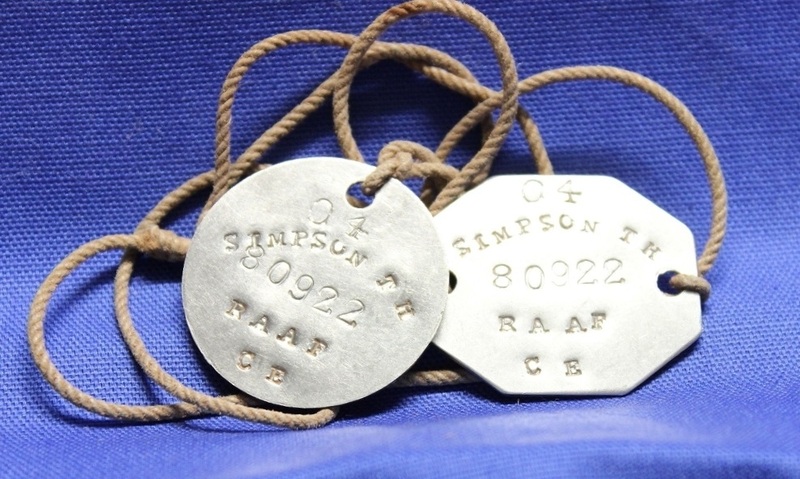 A pair of official identity discs stamped 04 SIMPSON T H 80922 RAAF CE. Thomas Henry Simpson enlisted on 8 Jun 1942 at Perth and discharged on 9 Jan 1945 as a Leading Aircraftman from 4 Aircraft Depot. 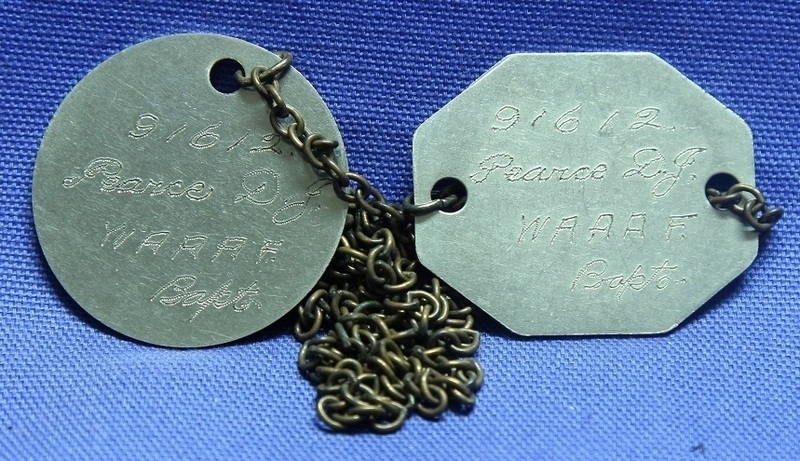 PI288 3 official identity discs 2 fibre stamped V69833 PR GILL L 04, 1 metal stamped GILL L 429796 RAAF PRES 04. Leslie Gill enlisted into the ARMY on 18 Mar 1941 and discharged on 27 Oct 1942, joining the RAAF on 28 Oct 1942 and discharged on 25 Mar 1946 as a Warrant Officer from 9 Aircrew Holding Unit. PI297. 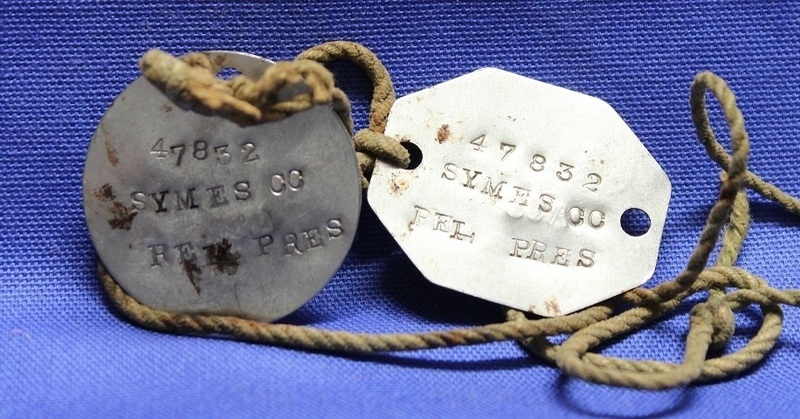 A pair of official identity discs stamped 47832 SYMES C C REL PRES A11. Cedric Charles Symes enlisted on 31 Mar 1942 at Mount Gambier and discharged on 29 Aug 1946 as a Leading Aircraftman from Care & Maintenance Unit Tocumwal. PI302. A pair of sterling silver identification discs engraved 82121 AC1 Boyd C R.A.A.F. A2. Clarence Morris Brockwell Boyd enlisted on 2 Oct 1942 at Perth and discharged on 31 May 1945 as a Corporal from Tocumwal. PI314. 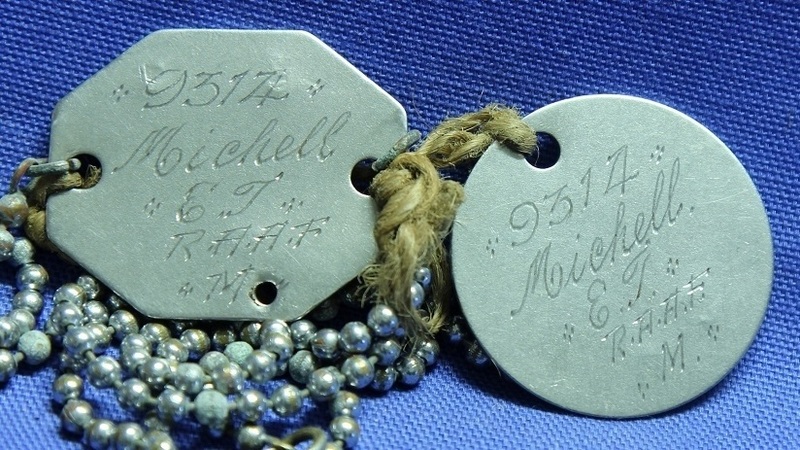 A pair of official identity discs engraved 9314 Michell E. T. RAAF M A2. Edward Thomas Michell enlisted on 26 Feb 1940 at Laverton and discharged on 20 Nov 1945 as a Warrant Officer from 4 Personnel Depot. PI315. 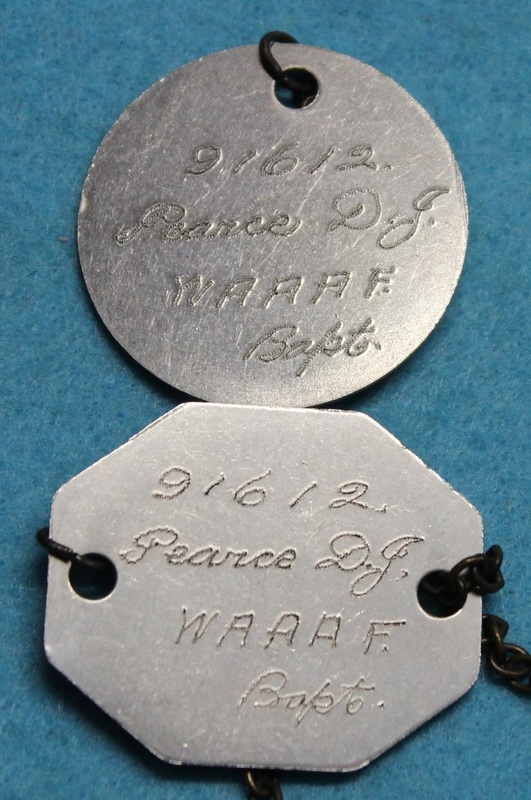 A pair of official identity discs engraved 91612 Pearce D J WAAAF Bapt 04. Dulcie Jean Pearce enlisted on 28 Nov 1941 at Adelaide and discharged on 12 Jul 1944 as a Sergeant from 1 School of Technical Training. PI316. 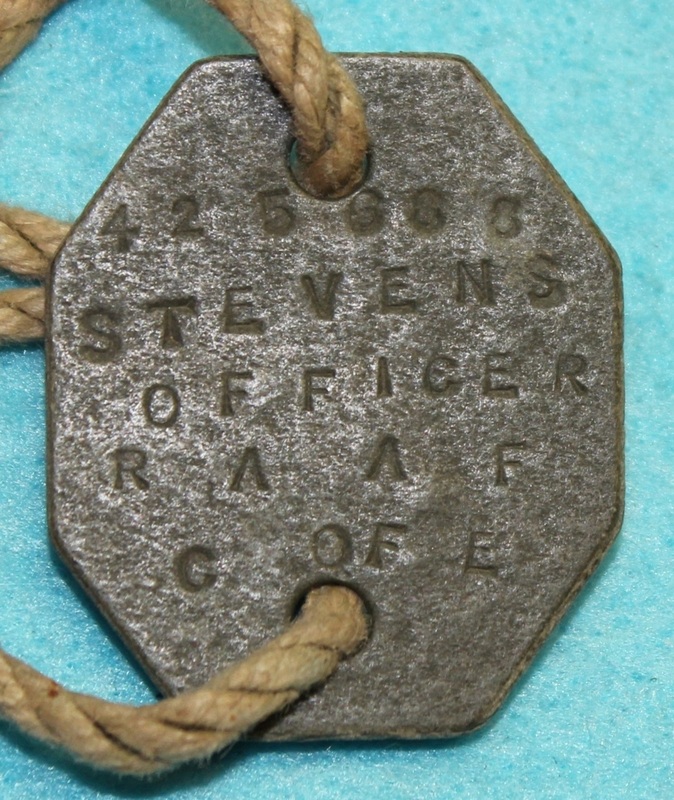 2 pair of official identity discs, 1 fibre and 1 steel, stamped 425688 STEVENS OFFICER RAAF C OF E 04. Mark Stevens enlisted on 25 Apr 1942 at Brisbane and discharged on 15 Feb 1946 as a Flying Officer from Brisbane Medical Unit. PI316. 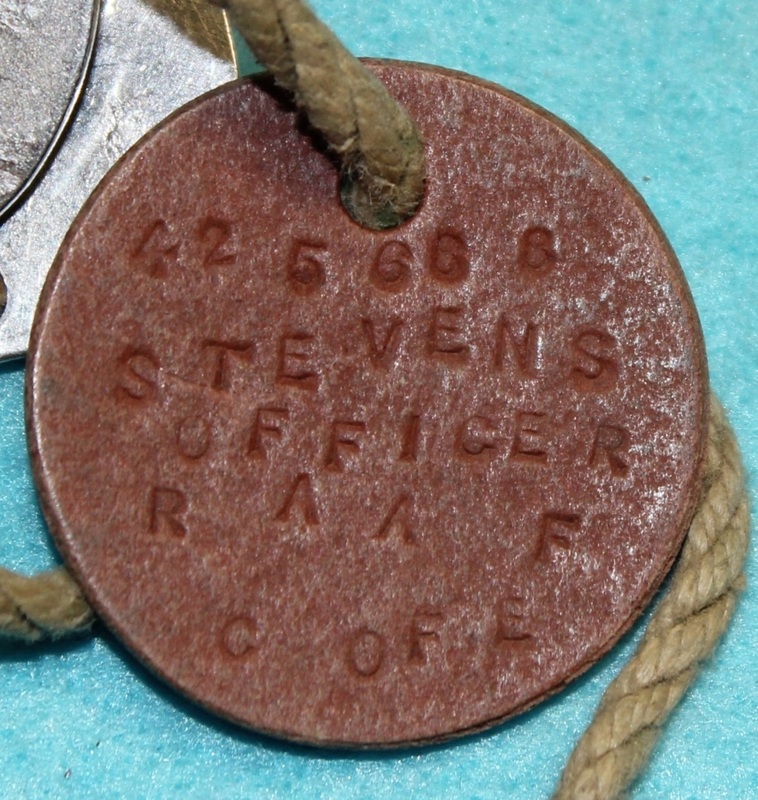 2 pair of official identity discs, 1 fibre and 1 steel, stamped 425688 STEVENS OFFICER RAAF C OF E 04. PI323. 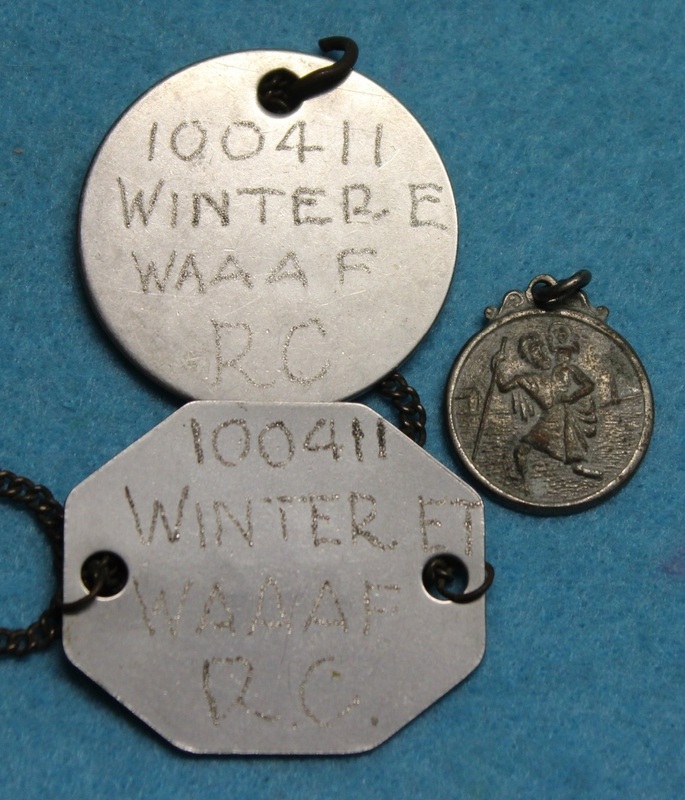 A pair of official identity discs engraved 100411 WINTER E T WAAAF RC A2, plus a St Christopher medal.